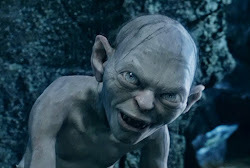 Smeagol lived alone for 500 years. We don't have any friends. Nobody likes us. Except nice Master. He looks out for us. But he stole our preciousssss. So we are on our own, so we likes this song from Les Miserables. Did you know that Smeagol can steal bodies? It's no fun to say it doesn't look like us singing.